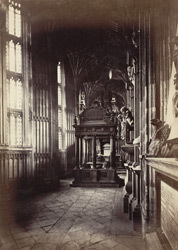 Interior of the Lady chapel built by Henry VII at Westminster Abbey from 1503-1519. "The North Aisle is chiefly remarkable as containing the Monument of Queen Elizabeth, who lies beside her sister Mary, under a cinque cento tomb, with recumbent effigy. It also contains a tablet to the memory of Edward the Fifth, and Richard, Duke of York, who were murdered in the Tower; and a tomb to Sophia and Maria, daughters of James I."